The OtiPASS’Alsace App is both a digital tourist guide and a digital journey log. The user can view all the Pass'Alsace’ partners and get information on all of them without internet connection after the initial download. By enabling geolocation feature it is possible to find the closest one. 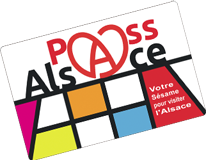 In association with a Pass'Alsace the user gets information on all possible visits with its package, consumed or not, the duration of his Pass’Alsace and the remaining time. For now the OtiPass’Alsace app is available for the android and Apple platform and will soon be offered for Windows mobiles.